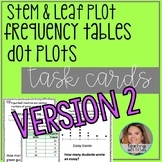 Includes 20 task cards that support 4.9B: Solve one- and two-step problems using data in whole numbers, decimal, and fraction form in a frequency table, dot plot (line plot), or stem and leaf plot. 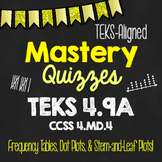 Includes gameboard, answer key, and answer document. 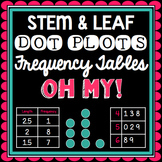 This is a 43 page Data Bundle that includes: Frequency Tables Range, Mean, Median, and Mode Stem and Leaf Plots Circle Graphs Each lesson includes a warmup, notes, a fun activity (game, partner activity, coloring), and an exit ticket. 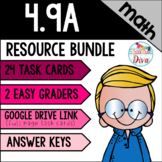 Keep your students entertained with this bundle! 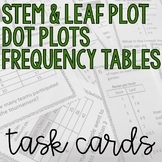 This 2 page worksheet plus answer key contains 6 multiple choice questions on frequency tables (creating and analyzing), including choosing appropriate intervals, and stem-and-leaf plots. 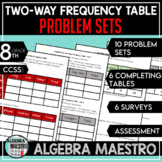 Great for test prep! 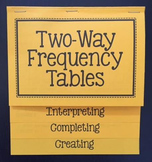 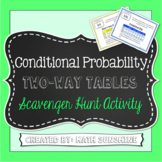 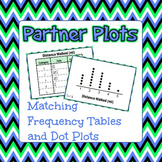 This poster can serve as a great anchor chart for students learning about Frequency Tables. 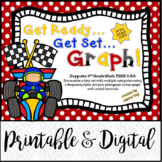 It is formatted to print out at 11x17 but you can reduce it down for students to paste into a journal.